I'm drinking red wine with ice cubes in it!? What does this mean? It's been a long day. I'm feeling a little trapped. The workers are here all day, for this entire week. In and out of the house. I feel a need to be here and keep an eye on things. Make sure all the little jobs are getting finished up. The situation won't change this week so I might as well go into my 'acceptance' mode. I'm fine in the morning. Busying myself with organizational tasks and keeping the cement dust at bay. By the time the sun hits and the air heats up - I'm ready to get out and about. Just a little restless .... a time of transition. a. a passing from one key to another; modulation. b. a brief modulation; a modulation used in passing. c. a sudden, unprepared modulation. 3. Theatre. a passage from one scene to another by sound effects, music, etc., as in a television program, theatrical production, or the like. Which definition applies the best? Perhaps 2c. Unprepared modulation? Although, I have pondered this time in Mexico, when I am getting settled, making myself a new life. So perhaps I am prepared, as much as anyone can ever be prepared. What about the Theatre? Things can be a little theatrical with me. After all, I am a Leo! For some years however, I have been practicing balance. Keeping my emotions out of it. Using them to their best advantage. Stepping back and being the observer. I am determining it is more of a passage ... a rite of passage. A transition or change in my concept of life in general. Am I transitioning, in the best possible way, not only into a different culture, country, and home, but also into my crone years? More inner strength, more balance, and might I even utter the words, more wisdom? With wisdom comes more questions. I realize I don't know anything anymore. Wanting to know more. Needing and digging for that deep understanding. A deep knowing of who I am, authentically. More honesty with myself. More putting the importance in life on what is really important to me. More emphasis on relationships, and the quality of life I need to feel content and fulfilled. More focus on creativity. More focus, period! I remember one of my spiritual teachers drumming into my head "Donna, you are what you focus on!" and "Don't put your attention there, it's not important." ... I do ramble on! These are the ramblings of a woman in transition. Don't leave me alone tooooo long! What can I show you today. 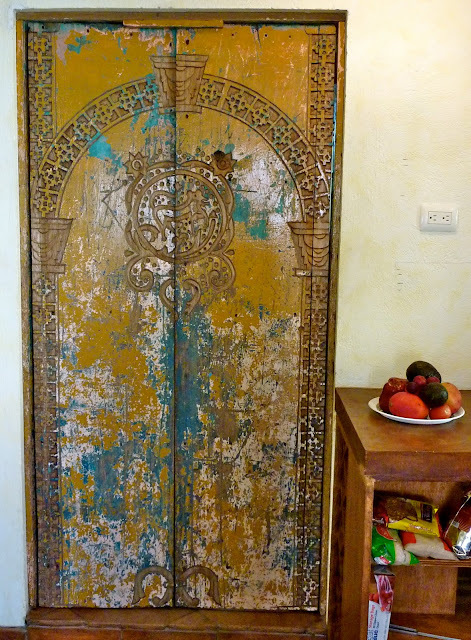 The old hacienda doors are now gracing my house. I need to purchase some old funky hardware for them. If only they could speak - I'm sure I would spend some fascinating hours listening to their story. They are beautiful. I adore them. I consider them a piece of art. They are highly carved. About 200 years old. I did not touch the surface except to seal it. They had to be 'cut to fit' ... unfortunately they lost a little of their grandure. I think they are spectacular! There is a shadow on my courtyard wall which is really cool. It's a shadow of my tree, my little chimney and an electrical poll which sticks out of my roof. Allow me to share.